Priya Chauhan is a Masters student of the History of Art at the National Museum Institute of History of Art, Conservation and Museology, New Delhi. What comprises the geographical area of Delhi today is a cluster of several old cities of historical and political significance. What’s ‘Old Delhi’ (Shahjahanabad) now, was a new city for the people of Mehrauli once. A city known for its cultural vibrancy. A brand-new city that developed over time around the periphery of the fort Quila-e-Mubarak, the Red Fort. Owing to the several entrances spread across the fort’s perimeter, the river Yamuna flowing in proximity, the grand Jama Masjid and several bustling markets, there was probably no area deemed not important in the city, putting to rest the notion of a city built according to a spatial hierarchy. Shahjahanabad, named so after the emperor who took the initiative of building the fort near the bank of the river Yamuna, was and is to date a commercially and historically important area. While a lot has been said about the city, it’s emperors, the settlements and planning, little has been done for its standing relics of housing and structures that are over 100 years old today. Several of these structures bite the dust every passing year, while many have completely ceased to exist, replaced by more built spaces, shops, godowns, or are reduced to squatter’s quarters. For a city inhabited till date, that once bustled with so much energy, thriving on its cultural past and glowing with the colour of an era gone by, the common apathy of a developing society towards its heritage has only been turning it into a city of a lost past and only regular functionality. It’s soon to be no more than a mere oxymoron—of organized chaos, of a place with so much character that it only stays in stories, and the way it feels not a reality but something fictional, the stuff of dreams past. This photo-essay aims to give a glimpse into some pockets of these tales enveloped within the city today, hidden from a common passer-by, separated by walls of protection and ignorance alike. As has been said of the city at an early stage, many a couplet would be sung in praise of Shajahanabad by the visitors and admirers, and more so for the latter between the fort and the city, for it’s the city that would engulf one in its embrace rather than the former, of which only the surrounding wall was a familiar sight (Chenoy 1998). Amongst a robust canal system, elaborate bazaars and residences, one component that made the social and visual life of the city interesting was the haveli. Havelis, the term derived from Persian word ‘hawli’ meaning enclosed space, were self-contained units, providing for its inmates, their families, and those dependent on them. Seen here are glimpses of a haveli that served as a dharamshala, a building of residence open to visitors and travellers to come and stay. A number of such dharamshalas and open dispensaries are functional even today in the city. The structure of the families thus residing in these havelis was such that often the relatives of a family would share the same household. Each haveli would have its own retinue of servants and helpers who would have very specific tasks, from watering the plants to the butler, the bearer to the story-teller. In some cases, the family of the servants would reside within the haveli too, to carry out specific odd jobs within the household. At times, hundreds of people would live in a haveli at once. The terraces would be used for sleeping under the cool breeze of the open sky at night in summers and the courtyards would be where all the social activities would resume. One question that comes is of why conserve or restore such places of residence? For one, they speak of a time when housing was very different from what the times after independence and experimentation with modern and contemporary brought. When the meaning of the term implying residence turned from the havelis to villas, and from villas to apartments, somewhere between changing times and changing equations of how families functioned, we lost something that served as a reminder of our vernacular traditions. And, hence, as an ode to the said values and lifestyle, pockets of such reminders should be saved for the generations to come and learn from. 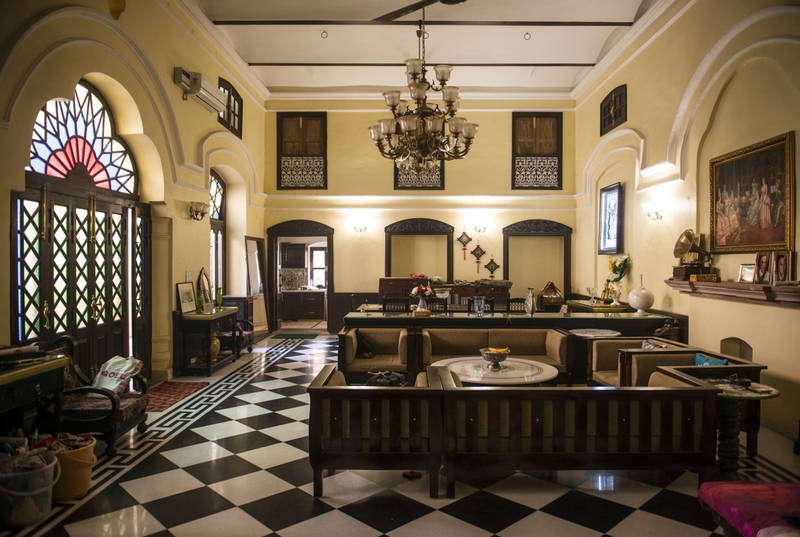 A recently renovated living area of Seth Ram Lal Khemka Haveli near Kashmere Gate, a haveli of a commoner who stayed and wanted to renovate his humble residence by modifying it completely with no trace of the old. Thankfully, on the skilled conservation architect Aishwarya Tipnis’ insistence, the project was taken from the point of view of 'adaptive restoration' instead of that of complete modification. 'I saw this grand entrance door and I said, this is a really important building and I walk into the courtyard and there lay an almost derelict haveli that hadn't been touched for 50 years, there were no repairs and behind the peeling plasters and behind the falling paint one could see that there was an architectural gem and my first question, I turned around and asked him, "Is this heritage?" and he said, "What's that, no it's my home, it's not heritage" because as a common man most people think that heritage is forts, palaces, ... museums, it's not anybody's house ..', recalls Aishwarya Tipnis about her first trip to the haveli. The challenges do not end even when you have the property, an understanding and a concerned conservation architect at hand. Since the cases of adaptive restoration are so few, the supply of things and services thus needed is a task in itself. 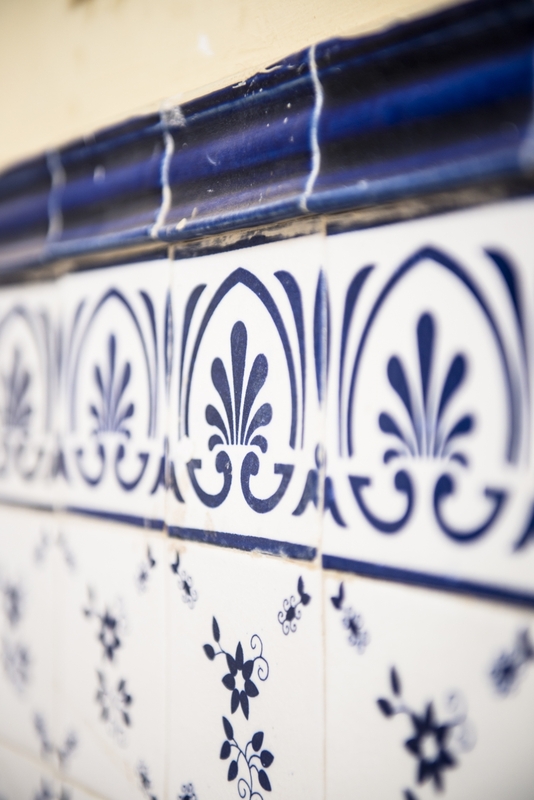 The tiles you see above were commissioned from a small factory in Khurja, Uttar Pradesh, the owner of which had agreed to experiment with the ‘old fashioned’ tiles that were zeroed down on after much research as being needed for the project. As one says, it’s all in the details. 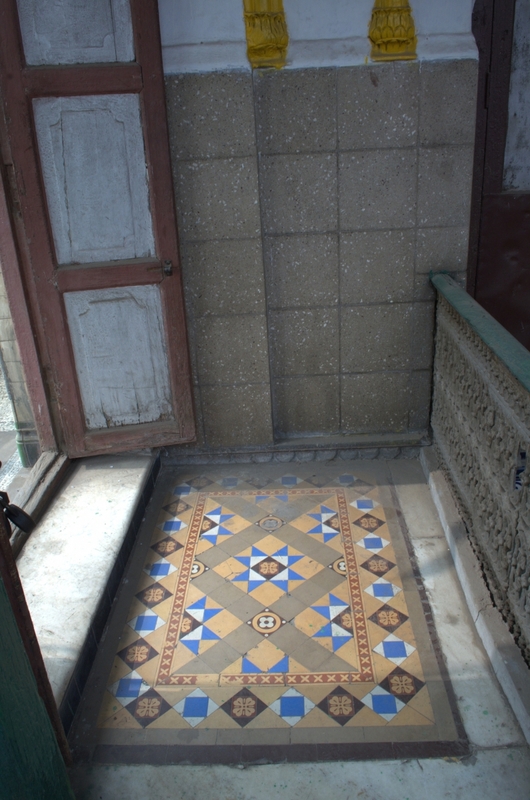 The design was inspired from Haveli Chunnamal’s use of tiles, as seen below, an image from the courtyard. 'Every book will say, "restore a building with lime", but nobody will tell you that lime is not available across the counter, like you can go and buy a bag of cement, in 2010, you couldn't go and buy a bag of lime. So, you had to make it. How do you make it? You have to go and get limestone. Where do you get limestone? How do you mix it, what are the proportions—we had to really work very hard to get the basics right', shares Aishwarya Tipnis who had to work by setting a lot of parameters herself and in order to share the knowledge and help other such cases, she also set up an online blog (http://thehaveliproject.blogspot.in/) bearing all the details of the challenges she faced with this project and their respective solutions. 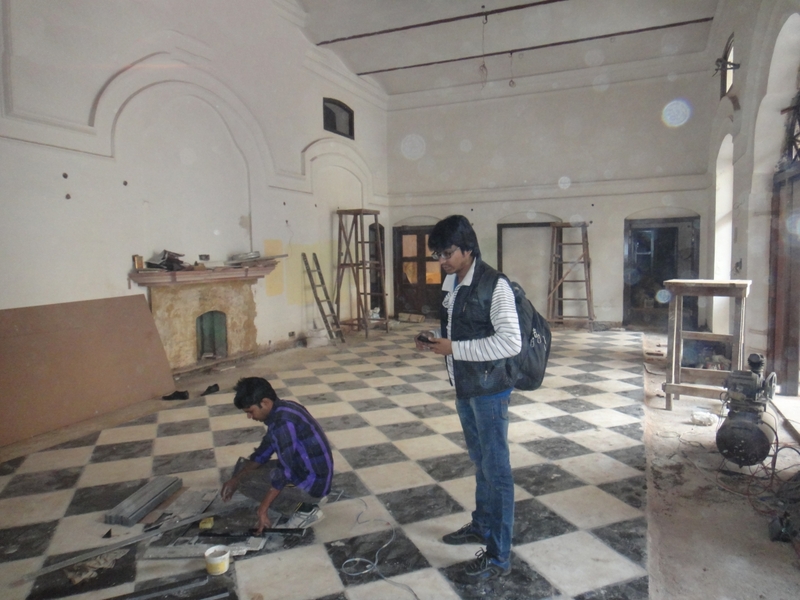 Stone polishing work in process at the haveli site. The in-house lime making installation can be seen in the background. And, while that is a story of adaptive restoration in another part of Shahjahanabad, this is a story of lineage and responsibility. The haveli of Lala Chunnamal, the first Municipal Commissioner of Delhi. Two humongous mirrors decorate the opposite walls of the baithak, one alongside the main entrance to the baithak from outside and one alongside the entrance from within the Haveli. A door, in the middle of the two, opens onto the balcony that runs along the first level of front elevation of the haveli from side-to-side, opening onto the main street. The baithak has all sorts of souvenirs and collectibles handpicked and displayed with great care. This is the room that has been maintained to some extent, with the intent of showcasing the glorious days that the haveli has seen. Beautiful chandeliers hang like stars in the sky under the ceiling which is covered with decorative cloth, there are two functional fireplaces and wooden dado running on all four sides. A marble engraved inscription right beside the main entry inside the baithak speaks fondly of the building and the room, ‘built so beautifully that not just the visitors but the stars and the moon might feel jealous’, it mentions the patron ‘along with the year this was constructed in', i.e., 1868. Anil Parshed (holding the frame) is the sixth generation of the Rai Chunnamal family that is living in the haveli. The photograph he is holding in his hand is captioned ‘Hindu Banker’s of Delhi 1878, from left Lala Rai Chunnamal’. It is a huge haveli with about 128 rooms and only a portion of it is accessible today. 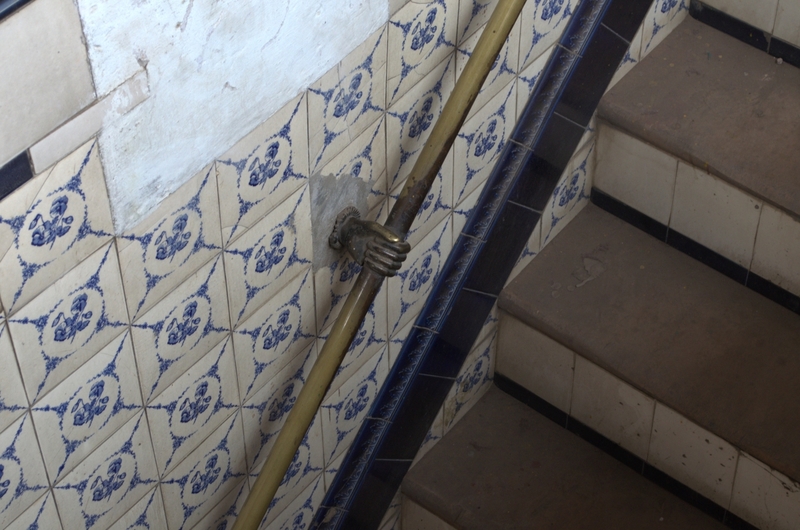 The front portion of the haveli is maintained by Mr. Parshed to this day. Of the two courtyards one sees on visiting today, one has been covered with a tin shed and one has been left open, as seen in this picture. Mr. and Mrs. Parshed have their sons and their families living with them as well, ‘They love this place as much as I do, in fact, they are the reason we are still here’, shares Mr. Parshed who emphasizes the fact that they have kept their work out of Old Delhi deliberately for their own and the city’s good. Is it getting harder to sustain life here, considering the onset of new problems every other day? Definitely, yes. The Parsheds face challenges with the building and its upkeep day-in and day-out. For one, it’s the traffic and chaos right outside the only functional entrance of the haveli. And for the rest, it’s the task of maintaining the space without any cooperation or guidance on how to do the same. Parshed stays keen on doing it the right way and maintaining it as a heritage building and hopes to turn it into the case of ‘Walk-In Heritage’ one day. A photograph dating February 26, 1936, showing a mehfil organized in the honour of Lala Ram Mohan’s marriage. The photograph is of the ground floor where one can only see a row of shops selling ethnic clothes. The structure of havelis took into account socio-cultural factors, whether of keeping common and private areas of the house separate and not in the direct gaze of visitors, adequate space distribution between the many people living in the same space or positioning things exactly as they want them to be perceived. We are now peeking into the haveli that is often referred to as the ‘Khazanchi Haveli’. 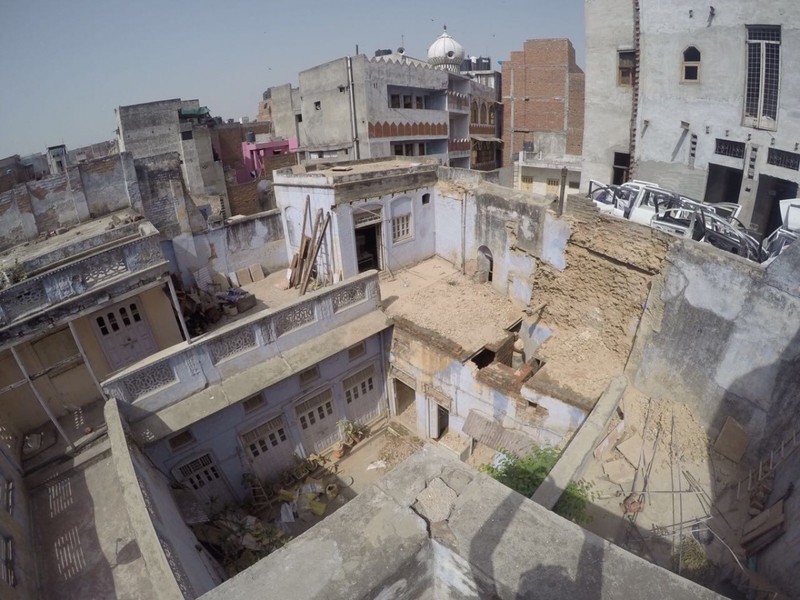 The locality is that of Jain accountants and though the significant portion of the haveli lies in a derelict state, there are several families still living on the first level, in small rooms overlooking the ghost of a courtyard where children of these households still play. Remnants of the past. Skeleton of the Haveli that once was. And, in another side of the same city lies a building that’s functioning as a government building, a rental house for a bank, in middle of a very busy electrical goods market. The building that was once Begam Samru’s palace was sold to Lala Bhagirath in the mid-20th century. The building is one of the earliest showing colonial influence with it’s long columns and bears the name ‘Lloyd’s Bank Ltd.’ at the top. The board that declares it a heritage building can easily be overlooked with the big cartons of goods and the usual hustle and bustle of the market overpowering it. In another pocket of the city is another haveli that had a change of fate recently. This ‘before’ photograph of the old haveli that was soon to become the only café in the Old City shows the state it was in until Omaiyer Fehmi, himself a resident of the Old City, took it upon himself to change the same. An array of upper storey terraces and balconies overlooking the courtyard below offers several different seating arrangements in a café that serves fast-food and regular ‘café’ menu in contrast to it’s counterparts within the area that serve traditional and Mughlai cuisine. The café goes by the name ‘The Walled City Café & Lounge’ and opened about two years ago. The courtyard, an important spatial element of haveli architecture owing to its appropriateness to the climate of the subcontinent, and the fact that it has been a recurring element in living architecture, adopted by various rulers over time who incorporated it for light, ventilation or other reasons. The lane has nine beautifully ornamented doorways leading to the houses of Jain merchants and at the end of the lane is a Jain Shwetambar Temple that houses perhaps the most beautifully decorated dome ceiling in the area after the Digambar Jain Temple. While this area continues to be lived in, some areas of continual residence, even though listed and marked important, do not see such care. One such case was with an alley around the Chooriwalan area that was vandalized in the name of a commercial project. The lakhori brick walls stand with irreversible damage done to them. This is the sight of the listed building that now has walls all coloured over. It also leaves us with a question, whom do we conserve this entire heritage for if the need for the same is not felt and the importance not recognized by the public who is directly or indirectly also responsible for maintaining them? In the end, to quote from the book Mansions at Dusk: The Havelis of Old Delhi by Pavan Varma,‘History may repeat itself, historical buildings do not’.